The Secret Santa Generator is a simple, free application designed to generate a list of Secret Santas without revealing who is getting gifts for whom. Think of it as drawing names from a hat. Just input a list of everyone participating in your Secret Santa gift exchange, and the Secret Santa Generator will create a simple .txt file for each of the Santas, telling them who they are going to get gifts for. * The Secret Santa Generator works without every participant having to be present for the drawing. Are your friends and family scattered throughout the country or even the world? Do busy schedules make it near impossible to get everyone in the same place at the same time? Just use e-mail, instant messengers, or social networking services to send each of the Santas the .txt file with their name on it. As long as you don't look in the files you won't know who is getting what for whom. No need to involve an objective third party to draw names for you. The corollary of course is that whoever is running the generator has to be someone who can be trusted not to peek. * The Secret Santa Generator is faster. When you draw from a hat, there is always the possibility that someone will draw their own name and then you will need to start the whole process over again. However, the Secret Santa Generator can run up to 1000 drawings in a fraction of the time, and it will never let any Santa draw themselves. 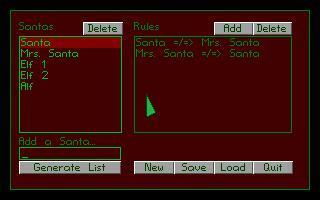 * The Secret Santa Generator's special Rules feature allows you to control who can be a Santa for whom. Don't want couples drawing each other? Worried about personal grudges landing someone with a crappy gift? Want to play favorites and rig things so you can get gifts for someone you really like? You can do all these things by making Rules that tell the Secret Santa Generator not to allow certain people to be Santas for each other. Use your own discretion. This is of course another reason why running the generator is a responsibility best left to trustworthy individuals. Don't extract it to Program files or anywhere that requires special permissions to create or edit files, or the .txt generating function won't work. Instructions are available in the ReadMe. Mirror links to the source code.